Dr. Sonia J. Rowley is a research scientist at the University of Hawai'i at Mānoa School of Ocean and Earth Science and Technology (SOEST), and Applied Research Laboratory (ARL). Sonia has been diving around the globe for 35 years, starting at a young age due to her parents operating the MV Maureen diving vessel in the UK. Her research is focused on the evolutionary relationships within and between the gorgonian (sea fan) coral holobiont and its environment. 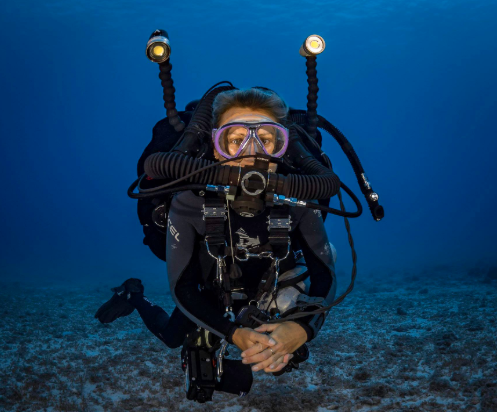 In 2016, Sonia received the prestigious Sir David Attenborough Award for her field and exploratory research to depths of >150-m/500 ft. using closed circuit rebreather (CCR) technology. She seeks to understand the biological success of gorgonian corals, in particular to their dominance at mesophotic and deeper ocean depths. Join Sonia as she guides us through her research, exploring how researching by the seat of your pants can often be the most rewarding.